The only time we hear from Ryan anymore is when Donald Trump talks about him. Paul Ryan used to be the star of the closest thing the Grand Old Party had to a boy band: the Young Guns. Cantor and McCarthy did their parts. But Ryan was everyone’s favorite: the heartthrob whose proposals to gut Social Security and Medicare got conservative donors swooning. By 2012, he had hit the big time: joining the Romney-Ryan supergroup that toured as the hottest Republican ticket since McCain-Palin. Six years later, however, the Young Guns are history, and Ryan is barely charting. Cantor (the leader) proved to be such a lousy leader that he was defeated by a local college professor in a 2014 primary. Paul Ryan was once a star. Now all he does is make excuses when Donald Trump sings off key. McCarthy (the strategist) proved to be such a lousy strategist that he was rejected by his own caucus in the competition to replace former House speaker John Boehner. Ryan (the thinker) is still playing. But the big-ticket days are over. He ended up with a speakership that he said he didn’t want. And his ideas have proven to be exceptionally unpopular—not just with the great mass of Americans who rejected him as a vice presidential prospect in 2012 but with the grassroots of his own party. The former “star” found that out the hard way in 2016. In an election year when Ryan fans had imagined that the Wisconsinite might take center stage as the Republican nominee for president, Ryan is instead appearing as a sideman in Donald Trump’s shock-rock show. Whatever shred of dignity the congressman might have maintained after his losing bid for the vice presidency (which included a debate pummeling at the hands of Joe Biden) has long since been lost. Ryan’s role in 2016 has been reduced to a recurring nightmare stunt. Whenever Trump strikes a horribly wrong note—as he did Tuesday with sinister speculation about how “Second Amendment people” might respond to the election of Democrat Hillary Clinton as president—Ryan’s job is to announce that, while he objects to the most awful things that Trump says and does, he still supports the Republican nominee. Ryan can tell himself that he is jamming on solutions that will make the future even better, but all that Americans are hearing these days are the sorry excuses he makes when Trump promotes intolerance, insults heroes, and trashes the Constitution. But the fact that the speaker of the United States House of Representatives had to put any energy at all into seeing off a primary challenge from a guy who introduced his candidacy with music videos of himself riding a motorcycle offers a measure of how absurd things have become for Ryan. These are miserable times for Paul Ryan. And things are unlikely to get any better for the tarnished golden boy. 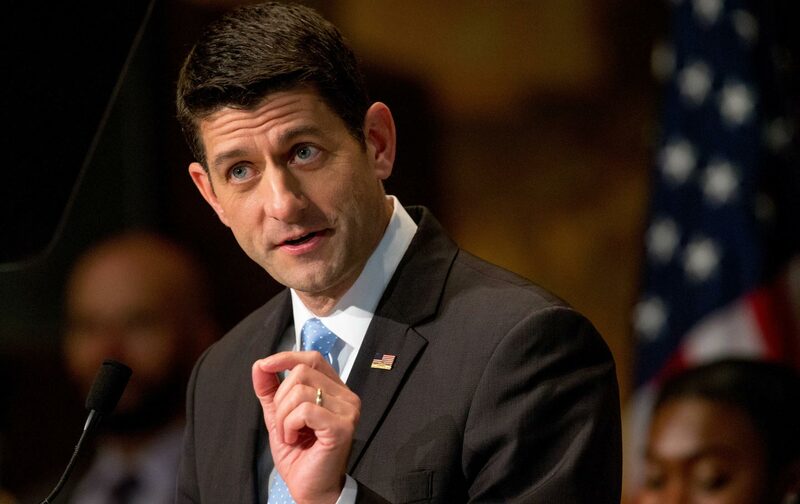 Does anyone really entertain the notion that what has become the “Party of Trump” will eventually long for the good old days of “Romney-Ryan” and embrace a Paul Ryan revival? Even “the thinker” must recognize by now that the Young Guns had their moment in 2010. Or, perhaps in his case, 2012. The moment came and went. “I hope he clears it up pretty quickly,” chirped the thinker.